LAS VEGAS, NV – Late last year, at Qualcomm’s Snapdragon Tech Event in Hawaii, we had the formal introduction of the first devices that were using the new Windows on Snapdragon platform and Qualcomm’s dream of bringing mobile technology to laptops to provide ‘Always Connected PCs’, connected through an LTE data connection. Qualcomm sells the upsides of this technology of providing laptops with 20hrs+ of battery life through using a smartphone processor, and through working with Microsoft, have a full version of proper Windows based on the system. The devices use native apps for best performance through the Windows Store, however 32-bit apps are machine translated into instructions that the Snapdragon SoC can process. It’s a lot of technology in a tiny device, and Qualcomm would seem to be the first CPU manufacturer to actually pull off x86 translation for the consumer market. 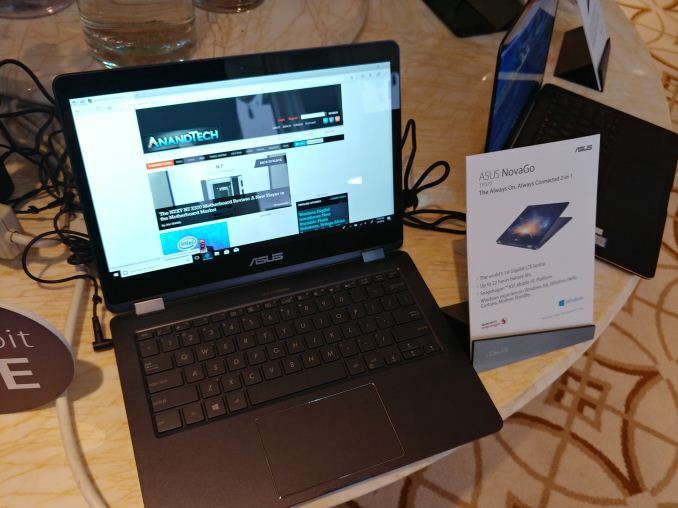 All of that aside, one of the first devices that should enter the market is the ASUS NovaGo. 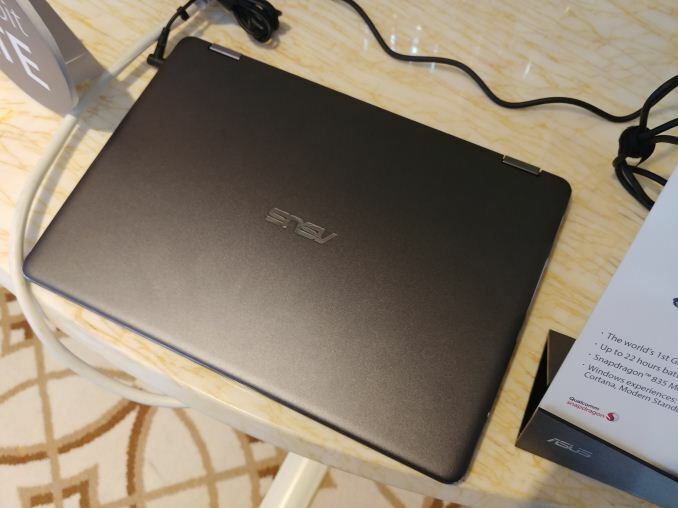 This is a 13-inch premium laptop/360-degree 2-in-1 design that has features such as Windows Hello and a fingerprint sensor built in while maintaining ASUS’ laptop quality and claiming up to 22 hours of battery life. 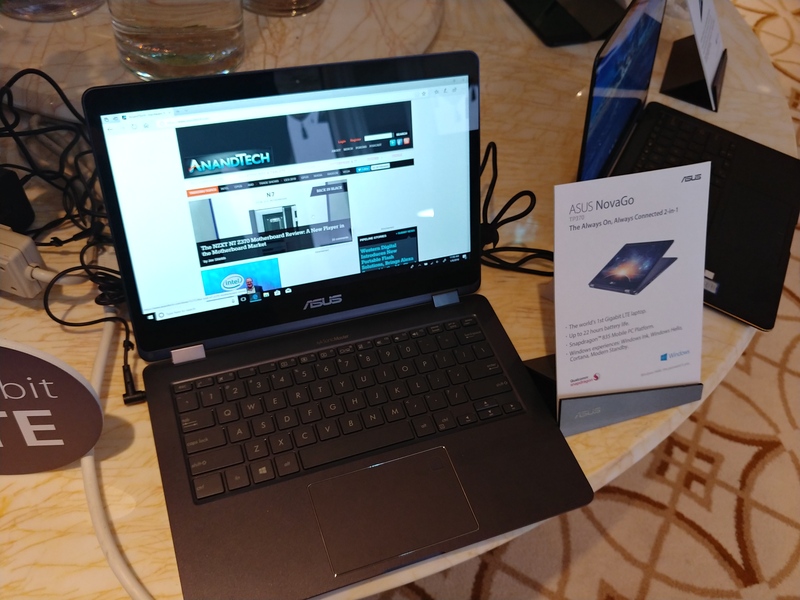 We have wanted to get our hands on one for a while, and I managed to get a couple of minutes at the show with one at the ASUS suite. Truth be told, the main fear that we have had with these devices is responsiveness. Smartphones on Android can be fast, with but something much bigger like Windows, it was not always on the cards that we would get the same level of responsiveness as, say, a Y-series Intel design. Back when we saw a super-early demo behind closed doors at IFA, it wasn’t the fastest, but on the NovaGo at least, everything seemed in order. Basic applications were quick and easy to open, and no visible lag from my untrained eye. Using the native compiled version of Edge, the best website in the world loaded as it normally does, and I was able to navigate the device as I would do normally with an Intel based laptop. Being familiar with ASUS’ device design, there were no surprises in the feel of the keyboard and touchpad either. Port support extends to a 3.5mm jack, a HDMI port, and two USB 3.0 ports. A quick look through the system settings showed eight Snapdragon 835 cores, the Adreno graphics, and a PCIe based SSD for storage if I remember correctly. With it being connected to the internet, I tried downloading CPU-Z, even in 32-bit, but it required me adding it through the Store page to get it to work. Alas, the Wi-Fi at the Las Vegas Encore was not giving me any favors with the Windows Store so I was unable to go down that route, so at some point I obviously want to see the effects of x86 translation. We were told by Qualcomm at the event a number of interesting things about the design of the platform, and how it has changed since we last met with them. Windows scheduler is configured to deal with cores of different level of performance, and it knows what programs are where and how to deal with them for performance and power, much like a good Android based scheduler. This was one of our worries, but we were categorically told that any internal worries they ever had are now fixed and it should run like a well-oiled machine. In gaming, Qualcomm stated that with the modern APIs, the Adreno GPU is natively compiled and doesn’t need translation. As a result, due to the way that Adreno works, for some titles it ends up being more computationally efficient over other solutions and causes less work on the CPU, allowing for more of the power budget on the GPU and an overall better frame rate. Obviously we want to get a hold of the device and test the claim, but if offers an interesting prospect. As for the NovaGo, with the addition of LTE and if it stands up to the battery life claims, it could be a neat little device depending on the price. 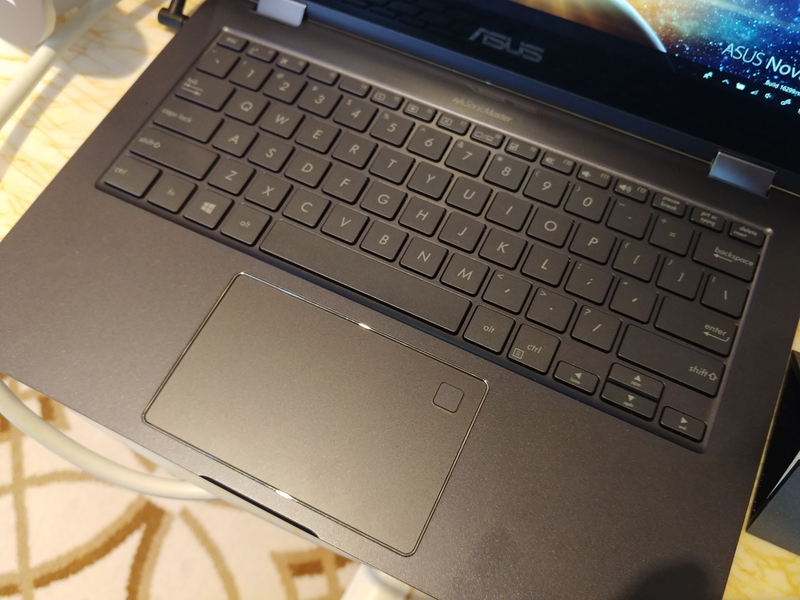 ASUS said they expect it to launch sometime during Q2. Yeah, I want Windows on a phone back...and if it's REAL Windows on a phone, with x86 compatibility, YES PLEASE. HEDT?! Unless a high clocked (at least 3.3 Ghz base all-core clock), high TDP (30 - 45 W), 6-wide minimum (or lower clock but even wider) ARM CPU/SoC is made, ARM will never enter HEDT space. Such a CPU *has* been developed, and is to be released in mid-late 2018, but not for the HEDT market. I do hope you all will get a one of these Windows ARM devices to test/review.